There are many different types of potato salad around the world, not just the bottled-mayonnaise-laden type you buy at a supermarket appetizing counter that most Americans (I know) grew up eating. Basically, wherever potatoes grow, people will have their version of how to eat them cold as a salad. So, when I set out to create my ideal version of potato salad, I decided to borrow inspiration from a smorgasbord of cuisines. My original thought was to lighten up the mayonnaise dressing on the salad, and go with a vinaigrette dressing instead. I wanted fresh bright flavors to make it the perfect accompaniment to summer meals. Potatoes can feel heavy on a hot day and I didn't want the dressing to weigh them down any more than necessary. German-style potato salad with the red potatoes and the vinegar-y dressing always sounds appealing, but often fails on flavor for me. I also wanted to keep it vegetarian friendly, so quick tricks to up the flavor, like adding bacon, was something I wanted to avoid. I had seen a recipe for the Potato Gribiche they serve at Rose Bakery, in Paris, and immediately knew that had to be my inspiration, with the capers and the lemon-y vinaigrette. But, it all came together when I decided that I was going to use classic Scandinavian flavors like dill and whole-grain mustard. If you don't like dill (which is really an under-utilized herb in my opinion), you could substitute flat-leaf parsley. But, you really should give the dill a try. At this point in my cooking, I'm finally (FINALLY) getting out of my baker-dessert mindset and am starting to feel confident without a recipe. I know the components of a vinaigrette and just winged it with what I had. I made a quick lemon-whole-grain mustard dressing and poured that over the warm boiled potatoes and some chopped shallots, capers and fresh dill. I ended up adding just a spoonful of mayonnaise after tasting it without it. 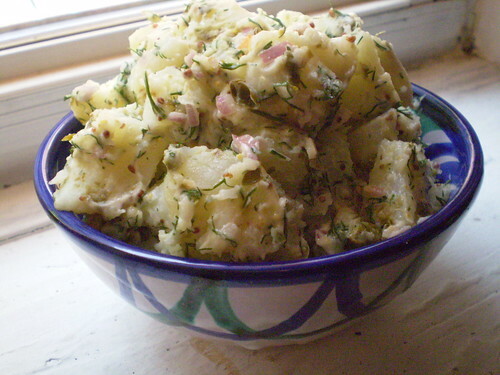 It just seemed to tie the ingredients together and add a familiar creaminess and tang that I love about potato salad. After all, no matter how exciting other cuisines are, a touch of home will always feel right too. Potato Salad It's great warm or cold, and the leftovers work well the next day. Peel and dice potatoes and put into a large pot with enough water to cover. Bring to a boil and cook until fork tender. Be careful to not over cook them, or you'll have mushy potato salad. 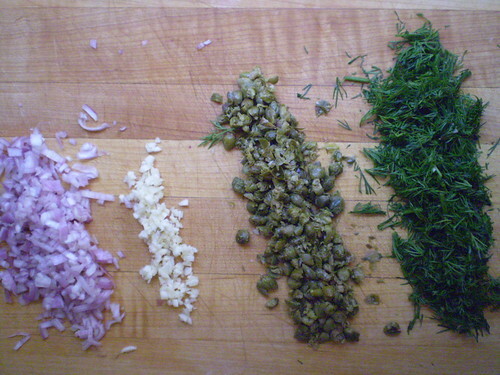 While the potatoes are cooking, chop the shallot, garlic, capers and dill. Set aside. In a large bowl make the vinaigrette. Taste and make sure all the seasoning are correct. When potatoes are cooked, drain well and add to the bowl with the dressing and other chopped ingredients. Toss gently to combine. Add the mayonnaise last and gently combine taking care not to mush the potatoes. Chill if not using immediately. 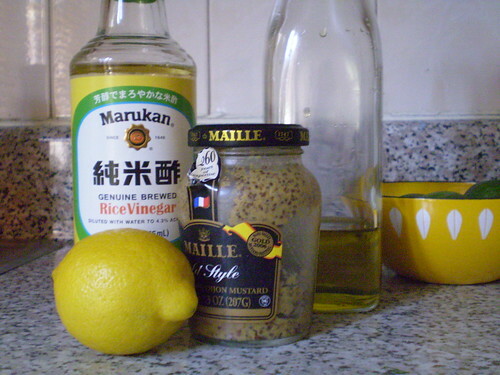 Put all ingredients in a bowl and whisk to emulsify.